The Australian Aborigines, the world’s oldest known culture, share a vast trove of stories, known collectively as “The Dreaming” or a spiritual realm that links past, present, and future and is home to fantastic creatures. The title character, Cleverman, acts as the human bridge between The Dreaming and the real world and possesses heightened senses and telepathic skills. Season 1’s six stories are reimagined Aboriginal tales, set in a near-future Australia, with a repressive government and ubiquitous electronic surveillance. The first episode introduces us to the “Hairypeople,” an ancient hair-covered humanoid species that speaks Kumbainggar (an Aboriginal dialect), and suddenly has “emerged” in public, six months earlier. The “Hairys” possess tremendous physical abilities, but are confined by the Containment Authorities to living in “The Zone.” Koen West (Hunter Page-Lochard) betrays Hairys to the CA for the extra money needed to support a pub that he runs with Blair Finch (Ryan Corr), and Blair’s girl friend, Ash Kerry (Stef Dawson). There is an ongoing series of brutal murders, all with the victims’ hearts ripped out, and these are blamed on the Hairys who become targets for capture and imprisonment. We meet a number of recurring characters like Koen’s half-brother Waruu (Rob Collins), a pro-Hairypeople activist, and his wife Nerida (Jada Alberts), wealthy entrepreneur Jarrod Slade (Iain Glenn) and his humanitarian wife Dr. Charlotte Cleary (Frances O’Connor), and crooked Immigration Minister Geoff Matthews (Andrew McFarlane), a political opponent of the Hairys, and his ruthless sidekick McIntyre (Marcus Graham). A number of important Hairys also début: Araluen (Tasma Walton), her daughter Latani (Rarriwuy Hick), Boondee (Tony Briggs), Djukara (Tyson Towney), and Harry (Isaac Drandic). The old Cleverman, Koen’s Uncle Jimmy West (Jack Charles) is an apparent victim of a ritualistic killing after his clandestine meeting with Slade. Afterward, a disappointed Waruu is passed over, as Koen, endowed with miraculous self-healing powers, becomes the next Cleverman. Following a fast-paced but somewhat confusing introduction filled with numerous characters and storylines, the remaining five episodes start to fill in the script’s lacunae. Koen experiences mysterious visions from Kora (Alexis Lane), a Dreaming spirit (previously revived by Uncle Jimmy) whom he later rescues from Dr. Everick’s (Aileen Huynh) medical experimentation. Meanwhile, Waruu and Harry secretly film the Hairys’ brutal prison life and enable a prison break. Things go from bad to worse for Hairys stranded outside the Zone as Araluen gets sold to brothel owner Frankie (Rhonnda Fiddleton), Latani becomes a fugitive on the streets, and Djukara nearly dies. A connection between Dr. Everick and Slade surfaces and suggests that there is a far darker purpose to the secret research in the doctor’s laboratory. Cleverman is a morality play set in a dystopian world where conventional values are turned on their literal heads. The treatment of racial injustice, “big brother” style oversight, and genocide are all addressed in this edgy Australian/New Zealand/American mini-series. Populated by an extremely strong cast that is supported by spot-on direction (Wayne Blair and Leah Purcell) and stunning cinematography (Mike Wareham), Season 1 leaves us with many remaining questions including the following. What will become of half-brothers Koen and Waruu whose mutual antipathy is evident? Will Charlotte have her child (and will it be normal)? What are Slade’s real plans for the Hairys? Will more legendary creatures emerge from The Dreaming? 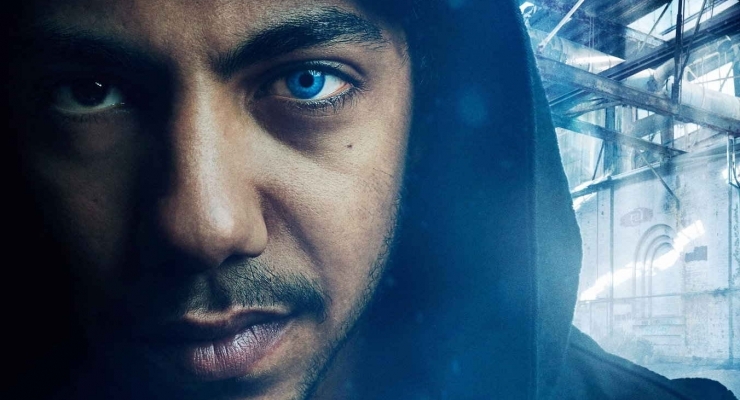 Fortunately, for Cleverman fans, some answers may be revealed next year as the series was recently renewed for Season 2. I will definitely add this one to my growing binge-watch list. Season 1 originally ran in the U.S. on Sundance TV and is currently available for streaming on Amazon and Netflix. Cleverman is a morality play set in a dystopian world portrayed by a strong cast supported by terrific direction and cinematography.